the features of an area of land, such as physical landforms, vegetation, man made structures, etc. Why is Pele important to Hawaiʻi Island? Have you ever seen or been close to an active volcano where Pele is? How did you feel? Why is it important to be observant and respectful in those places? 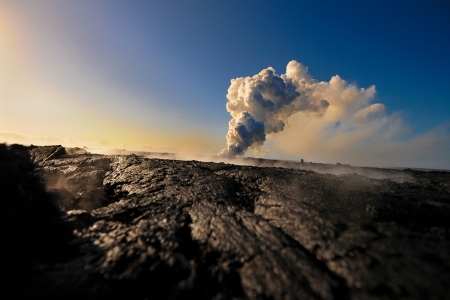 What is the difference between Pele in the form of lava and her other forms such as rock, land, sulfur, lightening, smoke, and vog? After Pele overtakes an area, the land is left barren until Hiʻiaka causes things to start growing again. 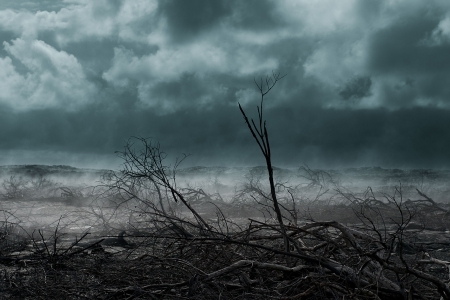 Is this cycle of destruction and creation of new life helpful for the environment? Why or why not? ʻAnakē Kekuhi says that Pele travels the world. In your class, do a research project to see how many active volcanoes there are in different countries. Where are the major eruptions happening these days? Some people are so kaulana that they have friends, fans, and followers everywhere they go . . . even without Facebook and social media! The volcano goddess Pele has that kind of popularity. Her reputation as a creative, passionate akua with an explosive personality has earned the respect of generations of people in Hawaiʻi, the Pacific, and throughout the world. Probably the best known of all Hawaiian gods and goddesses is Pele. She is the fire and the heat, the smoke and the steam, the goddess of the volcano. It is Pele that sparks the eruptions and adds new land to our island home. Pele is the volcano and the natural forces associated with volcanic eruption. Moʻolelo and mele inform us that Pele’s kuleana—her function or responsibility—is to create new land. In order to create new land, she covers the old land with lava, burning and destroying what was there. This is how she adds more land to the island. Her powers are both destructive and creative. Pele has added over 568 acres of new land to Hawaiʻi Island since 1983. Pele is said to have come from the faraway lands of Kahiki, along with some of her family. She made stops on all of the Hawaiian Islands, but only Hawaiʻi Island proved to be a suitable home. So it is there at Halemaʻumaʻu, in Kīlauea Caldera, that Pele resides. Because of this, Pele is known as “ka wahine o ka lua,” the woman of the crater. So where can you find Pele? Kīlauea is on the slopes of Maunaloa and is near the boundary between the Puna and Kaʻū districts. Puna is known as “‘Āina i ka houpo o Kāne,” or the land in the bosom of Kāne. Traditional sayings tell us that there was no place more beautiful than Puna. The lava flows Pele sends slow the progress of the people of there, causing setbacks. This inspired another traditional saying: “Lohiʻau Puna i ke akua wahine,” meaning that Puna is slowed by the goddess Pele. How do people interact with Pele? For some families of Puna and Kaʻū, Pele is considered a kupuna. The forces and forms of nature associated with the volcano are Pele’s family, and therefore are also respected. When you go to Kīlauea to visit Pele, there are important things to remember. It is best to ask Pele for permission to travel her lands. It is also expected to give gifts, hoʻokupu, when visiting. People may give praise in the form of a chanted mele or the performance of a hula. 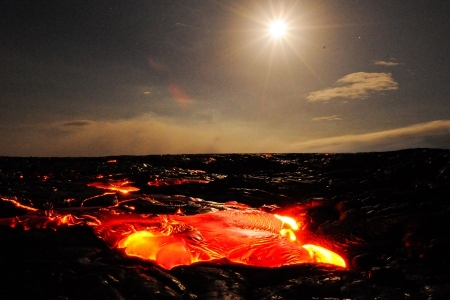 Those offering hoʻokupu wish Pele long life and ask to see the fantastic show of her fires. Mai hahaki ‘oe i ka ‘ōhelo o punia ‘oe i ka ua noe. Do not pluck the ʻōhelo berries lest we be surrounded by rain and fog. A warning not to do anything that would result in trouble. It is kapu to pluck ʻōhelo berries on the way to the crater of Kīlauea. To do so would cause the rain and fog to come and one would lose his way. It is permissible to pick them at the crater if the first ʻōhelo is tossed into the fire of Pele. Then, on the homeward way, one may pick as he pleases. How will you know Pele when you see her? 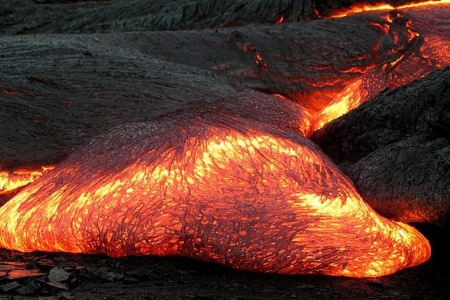 Pele’s physical forms include lava, fire, and other natural forces. She can appear as a beautiful young woman or an old lady. She may also appear as a ball of fire on the mountain. She may come in dreams where she appears in the form of a woman in the prime of life, dressed in white. How does Pele interact with other akua? There are many moʻolelo about Pele. These moʻolelo inform us of Pele’s genealogy, telling us who her family is. They also tell us about her adventures and deeds. A very old moʻolelo tells of a fire god who was here before Pele. His name was ʻAilāʻau, or forest eater, and he lived in Puna, right where Pele decided to live. As the story goes, not long after Pele arrived in Puna, ʻAilāʻau mysteriously disappeared. There was no great battle or confrontation of these two gods. Nor is there a story explaining what happened. Perhaps ʻAilāʻau went off to Kahiki, switching places with Pele. Pele sends her younger sister Hiʻiaka on a quest to fetch her sweetheart from Kauaʻi. During this long and dangerous trip, Hiʻiaka realizes her own powers as a goddess. She is the healer of land. Pele creates new land and Hiʻiaka follows by healing the land, making it fertile and causing things to grow. 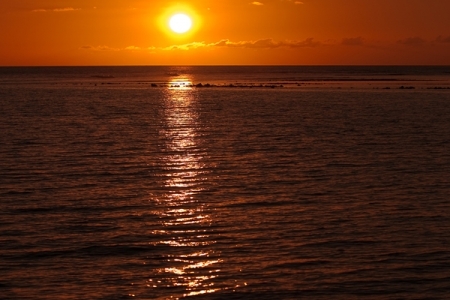 One moʻokūʻauhau reveals that Kānehoalani, the sun, is Pele’s father. 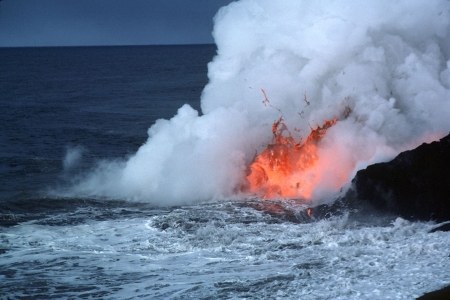 The connection between them is that they are both a souce of life, Kānehoalani being the heat and sunlight that sustains life on earth, and Pele being the fire and heat in the earth that creates the new land. Where can I learn more about Pele? Many Pele stories have been passed down orally, and many have been written down and recorded. Moʻolelo and mele give us lots of details about Pele and her family. There are at least ten different versions of the Pele and Hiʻiaka saga. There are tales of Pele and Kamapuaʻa and their battles. Stories of the migration of the Pele ʻohana and even the confrontation between Pele and Nāmakaokahaʻi, her older sister, add to the Pele lore. An epithet for Pele, who devours even the rocks and trees. This cliff, at the crater of Kīlauea, is sacred to Kamohoaliʻi, brother of Pele. Smoke from the pit never sweeps over this cliff, even when the wind blows against it. Instead, the smoke rises directly upward due to the great respect Pele has for this beloved brother. The tree-eating woman of Puna. …A pool not far from the crater of Kīlauea. The priests of Pele who knew of its location obtained water from it to mix with the ʻawa drinks they offered to her. A supernatural pāoʻo fish guarded it. This pool was destroyed during the making of a road. The back [guarded by] law. Said of Pele’s back, which was so kapu that to stand behind or approach it was punishable by death. Her back was said to be so hot that a bundle of taro leaves placed on it would cook at once. Her priests, chiefs, and certain of her devotees had a similar kapu—no one was permitted to walk or pass behind them nor wear anything that had been worn upon such a kapu back. When the boulders clash, the māmane tree weeps. This was first uttered by Hiʻiaka as she watched the fires of Pele destroy Lohiʻau. 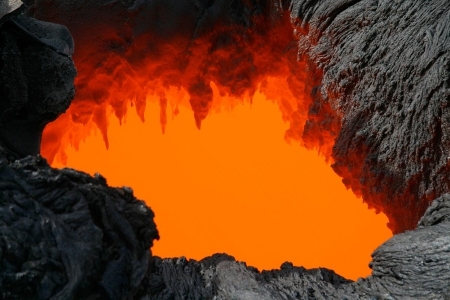 She described the terrifying outpouring of lava as it overwhelmed him. Later used to mean that when two people clash, their ʻohana often weep. Wrongdoing is feared in the upland of Puna. Wrongdoing in the upland of Puna brings the wrath of Pele. [May I be] devoured by Pele, [may I be] devoured by a shark. An oath, meaning “If I fail…” It was believed that if such an oath were not kept, the one who uttered it would indeed die by fire or be eaten by a shark.